In Hear This, A.V. Club writers sing the praises of songs they know well—some inspired by a weekly theme and some not, but always songs worth hearing. This week, in tribute to Mandatory Fun, we’re recounting some of our favorite “Weird Al” Yankovic songs. Like any “Weird Al” fan—or anyone semi-pop culture savvy and between the ages of 20 and 40—I absolutely love a whole slew of “Weird Al” songs. I remember watching the “Fat” video on repeat, and I still marvel at the novelty and intelligence behind some of Yankovic’s polka medleys. The song I return to the most, though—and I absolutely blame The A.V. 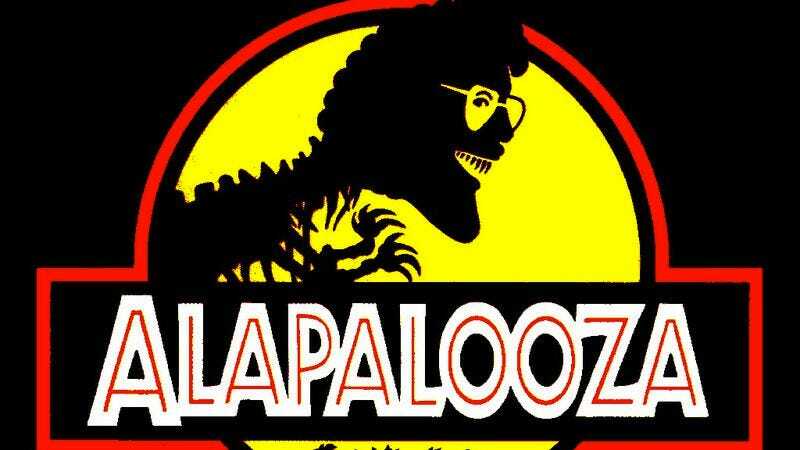 Club for this—is “Jurassic Park,” off Yankovic’s 1993 album, Alapalooza. I was 12 when Alapalooza came out, thus putting me right smack in the target demo for both Yankovic’s records and Jurassic Park. I knew both the record and the movie backwards and forwards, and though I’m sure I had heard Jimmy Webb’s “MacArthur Park” at the time (I listened to a lot of oldies radio), I still think of Yankovic’s version as almost singular in its scope and sweeping drama. That could be because of the way it so seamlessly blends into Spielberg’s Jurassic Park, which wasn’t the most highbrow movie but certainly captured the hearts, minds, and butts of a generation of viewers. And while “Jurassic Park” the song isn’t Yankovic’s smartest piece of satire—a number of critics have pointed out that it pretty much just recounts the film’s plot and mentions lovable purple dinosaur Barney—it’s still a remarkable piece of work in that a saccharine song about cake and rain can somehow become a smartly focused piece about dinosaurs and death. Of course, I’d be remiss if I didn’t talk about the song’s accompanying video, in which animators Mark Osborne and Scott Nordlund aped Claymation pioneer Will Vinton’s style to humorously gory effect. While the pair probably worked with a bigger budget than most videos would have nowadays, they were still able to do more with less by using clay, thus creating a clip that is not only repeatedly watchable, but also pretty ingenious.